Along with reproduction, balancing energy expenditure with the limits of resource acquisition is essential for both a species and a population to survive. But energy is a limited resource, as we know well, so birds and mammals – the most energy-intensive fauna on the planet – must reduce energy expenditures to maintain this balance, some taking small steps, and others extreme measures. 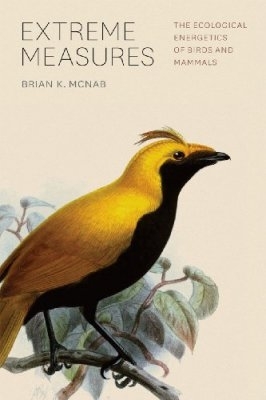 Here Brian K. McNab draws on his over sixty years in the field to provide a comprehensive account of the energetics of birds and mammals, one fully integrated with their natural history. McNab begins with an overview of thermal rates – much of our own energy is spent maintaining our 37 degrees Celsius temperature – and explains how the basal rate of metabolism drives energy use, especially in extreme environments. He then explores those variables that interact with the basal rate of metabolism, like body size and scale and environment, highlighting their influence on behavior, distribution, and even reproductive output. Successive chapters take up energy and population dynamics and evolution. A critical central theme that runs through the book is how the energetic needs of birds and mammals come up against rapid environmental change and how this is hastening the pace of extinction.